The Church of Boston begins her Bicentennial Celebration! This Sunday, December 2, 2007 at 2:00 PM, Cardinal Seán P. O'Malley will be joined by priests, religious, deacons and parishioners from around the Archdiocese of Boston celebrate the opening Mass for the bicentennial. The bicentennial celebration will be observed over the next twelve months concluding with a closing liturgy on Sunday, November 23, 2008 at the Boston Convention & Exhibition Center. The centerpiece of the yearlong celebration will be a comprehensive process of spiritual renewal. This process, now underway, is being be offered by RENEW International and is entitled ARISE: Together in Christ. Many events, talks and liturgical celebrations will take place during the course of the year. Our life is a journey with Christ and our lives together are marked by tremendous and touching stories. Our society and world is in desperate need of inspiration from great thinkers, gentle souls and creative, happy women and men who are being formed as disciples of Jesus Christ. To this end, we would like to help you tell the world about the stories of Faith that you have seen, heard or told. We invite you to submit a video of between three and five minutes which creatively tells the true story of the Faith of an individual, couple, family, group or parish. The video could be of various styles including fiction, non-fiction, documentary, exposé, comedy or YouTubesque. This video must be completely original and follow closely the guidelines included with this letter. We reserve the right to choose or not to choose the video for airing...we also reserve the right to play the heck out of it if it is really ingenious and fun!If chosen, your video could be seen nationally in a new series on CatholicTV tentatively called: One Faith! This is your big chance to inspire many others outside your circle of family, friends and parish toward a deeper Faith in Christ. The deadline is January 21, 2008 so get working…you never know whose life you will change by telling your one great story of Faith. For more information about the OneFaith project, click right here. Skin Cells? Stem Cells? Watch CatholicTV! The incredible engineering behind stem-cell research is beyond most of us. The fact is, we might be on the cusp of some incredible breakthrough in medicine which could have an impact on all of our lives and the quality of the years we have left. This Friday during our live show, "This is the Day" (live, Friday at 10:30 am EST) we will be privileged to have Father Tadeusz Pacholczyk, Ph.D. join us to discuss some new, exciting and morally solid developments in this line of research. Father Tad earned his doctorate in neuroscience from Yale and did post-doctoral work at Harvard. He currently serves as the Director of Education at The National Catholic Bioethics Center in Philadelphia. Father Tad will explain how simple skin cells, when carefully harvested and reprogrammed, could allow us to exploit the advantages of embryonic stem cells without the destruction of human embryos. Although this new development is not without shortcomings and the need for more research and experimentation, the idea that my skins cells or yours could one day produce new tissue specific to us as individuals without the threat of rejection...this is an absolutely astonishing breakthrough. Every month here at CatholicTV we are excited to share our thoughts and any new developments at the station with our viewers. We actually mail the magazine, free of charge. 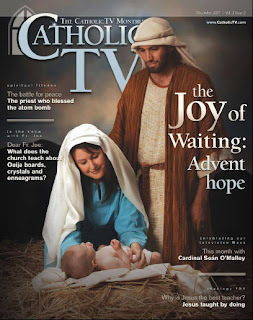 This week, the December CatholicTV Monthly will be arriving in mailboxes and the coverstory is: "The Joy of Waiting: Advent Hope". It seems to me that the older you get, the more time is spent in remembering. What a wonderful gift God has given us in our memories! How terribly sad it is when someone we love loses the ability to remember because of a debilitating disease like Alzheimer’s or dementia. Our recollection of the good things that have happened to us, as well as the bad, these memories make up the fabric of who we are as unique individuals; and there remains in each one of us a youthful anticipation. Some would say that the coming Advent Days are the most exciting of the whole Church calendar. These will be days filled with the images of light and darkness, of joyful anticipation ofthe nearness of our God. There is no taking Jesus Christ out of Christmas, for we know deepwithin us that He is the reason for this holy season. We long for Him as for life itself. Although we forget, in our hearts we know that Jesus is our only hope, the light of our lives and our world. If you would like to receive a copy of the CatholicTV Monthly and learn more, we would be glad to send it to you each month. Just visit our website and sign up on-line right here. We would be pleased to welcome you to the CatholicTV family! 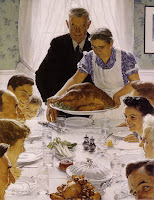 The celebration of Thanksgiving in our country and with our families is an annual reminder of how grateful we really should be. Now that the holiday is past, this Monday morning gives us an opportunity to be grateful. This should be a daily practice for it is a practice of our Faith. Personally speaking, I am not feeling that well. I came down with some brutal chest cold late last week and it really has a grip on me. However, this afternoon I am going to visit with a man in his 50's, the brother of a neighbor of mine. This man is in the last stages of a fight with cancer. He wants to talk about death and his funeral. So, as you can see, I have every reason to be grateful, even if I am physically dragging. Apart from my health, my Faith, my priesthood, my family and friends I remain daily thankful for the chance to work at CatholicTV. We have a fantastic group of people who make this Catholic television station run 24 hours, every day. We have many generous priests who come in to celebrate the television Mass and not without personal sacrifice. We have good programs and a bright future. Best of all, I feel we represent and serve the average, good Catholic who is out there striving to be like Jesus Christ in the midst of daily living! So, consider yourself quite fortunate today and make this a daily practice. God has been so good to you and me. Make gratitude to Almighty God the first prayer of your day, every day. a CatholicTV thought: Who is the Lord of all? This month we have tried, according to our Catholic tradition, to pray a lot for those who have died. Faced when we are with the mystery of death, the inevitable question in all of this, for all of us is: “why?” Death is not natural for us…tragedy is not God’s will, God does not desire us to suffer. But we are trapped in our frail and sinful human condition. In the end, I am convinced a reason for all that has occurred will be found, the questions will be answered, and even the tragedies of life will make sense. Today we conclude the Church liturgical year by honoring Jesus Christ as King of all creation – perhaps “Lord” is an even better term. For Jesus Christ is in charge of everything, even death. We, however, love to pretend that it is we who are Lord, we who are in charge. Of those two criminals hanging on either side of the Lord on Calvary, only one had learned this lesson. Our eventual demise and all the “little deaths” which are dealt to us and through which we pass are the road to new and abundant Life in God’s Kingdom. “Well, that’s all fine and good,” you might think – “but what about today, what about this week? What do we do when tragedy strikes…when we must carry our cross?”Well, I guess we do what comes natural to us as men and women of Faith…we band together, we share our sorrow, and we turn in prayer to Jesus our brother. He suffered and died and rose to new life. He is Lord of all creation…and He is with us here…and always. The Book of Revelation reminds us that Jesus is “the Alpha and the Omega.” The meaning of those words lies, of course in the fact that Alpha and Omega are the A & Z of the audience St. John was addressing. Jesus is for us and for all creation the beginning and the end, the author and the finisher of Faith, of life itself and of all things.So, as we honor Christ the King, Jesus, Who is Lord of all…we put everything…all our situations, our problems and questions, our loved one and our very lives into His capable hands. He who has begun the good work in us will certainly bring it to a good end…if we let Him!Jesus is the Lord of all. All praise and honor be His, now and forever! Oh, and don't forget to check out what's new at CatholicTV by pointing your browser to http://www.catholictv.com/! Pope Benedict XVI created 23 new cardinals today, including 2 Americans. This new group of Red Hats includes 18 electors who under the age of 80 and therefore eligible to vote for the next pope. The two Americans are Cardinal John Foley who served for 23 years as President of the Pntifical Council for Social Communication and Cardinal Daniel DiNardo of Galveston-Houston. DiNardo, born in Steubenville, Ohio, and a priest of the Pittsburgh diocese, also served in the Congregation for Bishops from 1984 until 1990. In the case of Cardinal DiNardo, many feel that the red hat is considered a recognition of the shifting Catholic population in the United States, away from its long-held center on the East Coast toward the Southwest. A consistory is the gathering of Cardinals and the ceremony in which the nominees formally become members of the College. The appointments bring the total number of American cardinals to 17, and the number of cardinal-electors to 13. The upcoming Friday, November 30, 2007 episode of CatholicTV’s live show entitled “This is the Day” will feature an interview with Rev. Tadeusz Pacholczyk, Ph.D. Father Tad, the Director of Education at the National Catholic Bioethics Center, will provide commentary on the recent successes in re-engineering skin cells to perform as stem cells avoiding the moral dilemma associated with embryonic stem-cell research. This is an exciting development in the health care field. Father Tad will be interviewed by the Director of CatholicTV, Father Robert Reed, and Jay Fadden, General Manager. Also appearing on the show is Joseph Reardon of Por Christo, a non-profit, medical volunteer services organization in the field of international health. It was founded by the Catholic Archdiocese of Boston in response to the 1979 visit to Boston of Pope John Paul II, who challenged the people of Boston to share their abundance with those in need, particularly in Latin America. If you have not heard of us, CatholicTV® is a 57-year-old broadcast, cable and production company with headquarters in Watertown, MA. CatholicTV provides family-friendly, religious, news, teaching and entertainment programming. Founded in Boston, Massachusetts well over fifty years ago, CatholicTV is available in selected areas in the United States and Canada. At our high quality website www.catholictv.com, programming is available 24 hours a day, seven days a week all over the world.